We've been waiting quite a while for any real news on the Linux port of Ashes of the Singularity: Escalation [Official Site]. While we still don't know when, we do know it's still happening. Mac isn't looking as viable. We really thought they'd embrace Vulkan. The nice thing about Linux is that it provides a fairly neutral platform from which you can then go to other platforms. Just something I thought that was quite interesting, which I'm sure some of you would also appreciate seeing. As a big fan of RTS games, it's been on my radar for some time. At some point someone gifted it to me, so I would really like to try it. "The nice thing about Linux is that it provides a fairly neutral platform from which you can then go to other platforms." What does it means? The game is developped on Linux? If so, it should be well known in the industry. 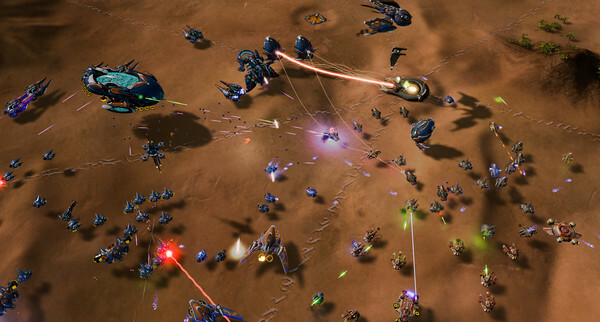 Ok, Ashes of the Singularity is not a perfect example, but am I wrong to think that it should make things easier when it comes to Linux ports too? I think part of what he means is that out of the big three - Windows, Linux, and macOS - both Windows and macOS have their own radically different APIs, while Linux sticks to the more neutral POSIX APIs. And as it so happens, both Windows and macOS supports much of those same POSIX APIs as well. So programming a piece of software on Linux using the native APIs makes it a lot easier to port onwards onto other platforms like Windows or macOS. I honestly thought I'd not hear anything further about this. Maybe they intend to use GNU/Linux to help with future development? It definitely would be more convenient (in my own opinion) to plug into an automated backend. That alone makes it worthwhile, so maybe Ashes will be used as a kind of launch platform for that. And if not...well, I'd still like to play this one for myself too (though I already have a copy, courtesy of my last video card purchase, I've never installed it even in wine). --edit: me wonders if MoltenVK will be used, or if there are features they need that Metal simply doesn't support. I know there is butthurt in Mac forums right now. And thought of that is making me smile. Those tears, ummy yammee! I fast on no carbs diet, but those tears are so sweet, like round fat fingers covered in doughnut chocolate of rich fan boys who have more money than sense. mirv I'd still like to play this one for myself too (though I already have a copy, courtesy of my last video card purchase, I've never installed it even in wine). Force is strong with this one. Just my personal experience. It's quite easy to lock yourself into Windows (DirectX) and macOS (Metal, Cocoa), but basically everything on Linux is cross platform by design, and we have both OpenGL and Vulkan. So it is much easier to port Linux applications to macOS, Android, and even Windows, than the other way round. Programming on Linux is also quite a pleasant experience, even though the lack of Visual Studio and some more specialized commercial tools remains an issue. Graphical design, 3D modeling, and video editing tools is a bigger problem for game development on Linux. At least if you are developing a game from scratch, and not making a port. Also Apple really shot themselves in the foot by deprecating OpenGL (and OpenCL), and trying to force developers onto Metal. I really think they are overestimating how big they are and how much leverage they have. There has been talk of games being streamed to consoles to bypass their subpar hardware, while the games would actually run "in the cloud". Linux runs on most servers and the M$ pricing model is horrible for servers(per core, per CPU socket, really complicated nonsense). Linux is the perfect OS for hosting those players, which would leave only the control scheme to be refined for controllers. Dmitri Seletski I know there is butthurt in Mac forums right now. And thought of that is making me smile. Those tears, ummy yammee! I fast on no carbs diet, but those tears are so sweet, like round fat fingers covered in doughnut chocolate of rich fan boys who have more money than sense. Hum, I can certainly empathize with them. I would certainly prefer all games to be as widely available as possible. Maybe they could use MoltenVK in the future? That dev statement is nice, I know what they mean, but I would certainly love them to elaborate a bit on this, as this would probably be a good argument for porting games to Linux. I don't know what the hold up is. They've had Vulkan support for nearly a year now and asked if Linux customers had any interest 13+ months ago. I believe over 1,000 people signed the steam thread. Granted that isn't a massive figure in the grand scheme, but it's the most active thread on the steam forum for that game. My guess is they haven't really put any real work into it, maybe just tinkered with the idea while focusing on other stuff. But they're welcome to prove me wrong, release a port and I will buy it. Not getting a penny otherwise. I think Stardock are on the right path, slow but getting there, the fact that Vulkan is on their tongue rather than DX11/12 is a good sign. Having a Cross-Platform foundation makes it easier in the long run. Too bad about Mac, it could have been a great gaming platform if Apple didn't ruin it, many games were even ported over long before Linux became popular. Maybe there's hope with MoltenVK yet?